For most people, warm weather brings many images to mind: brightly colored flowers, carnivals, sunshine, sandy beaches, and barbecues. Many find themselves outdoors more often and gardening their homes. Seeds are planted, new growth begins, and the anticipation of summer becomes one of the top thoughts inhabiting minds everywhere. However, for one couple, the season brings with it an entirely different force of nature, one which will change their world forever. So begins the tale of Timothy Green and his odd life. 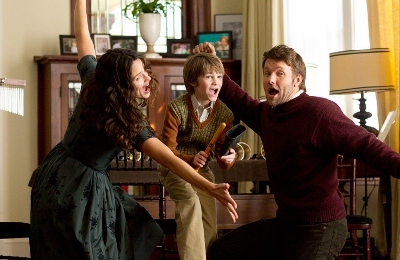 The Odd Life of Timothy Green, an upcoming Disney film, tells the story of Jim and Cindy Green (Joel Edgerton and Jennifer Garner), a couple desperate to start a family. The Greens can only dream of what it would be like to have a child. One night, they write down their hopes and bury them in a wooden box outside their home. Little did they know, this act would soon reward them with a mysterious child named Timothy who proves that sometimes the unexpected can bring some of life’s most precious gifts. 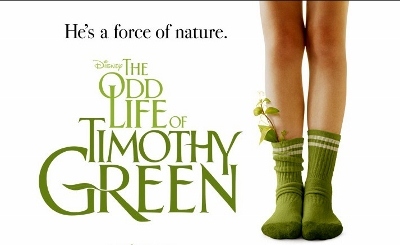 Directed by Peter Hedges, Academy-Award nominated director and writer, The Odd Life of Timothy Green will hit theaters August 15, 2012. I’d be curious to see how this shows up in the parks. More and more emphasis is being placed on nature and the wild that it would not surprise me to see Timothy and his world appear in Animal Kingdom where conservation is such an educational priority. Similarly, the classic theme of motherly love is no stranger to Disney films. Just think back to how many of our favorite films touch upon this with Dumbo, The Hunchback of Notre Dame, 101 Dalmatians, and Bambi, to name a few. All in all, this appears to be a magical story set to inspire many families this summer.